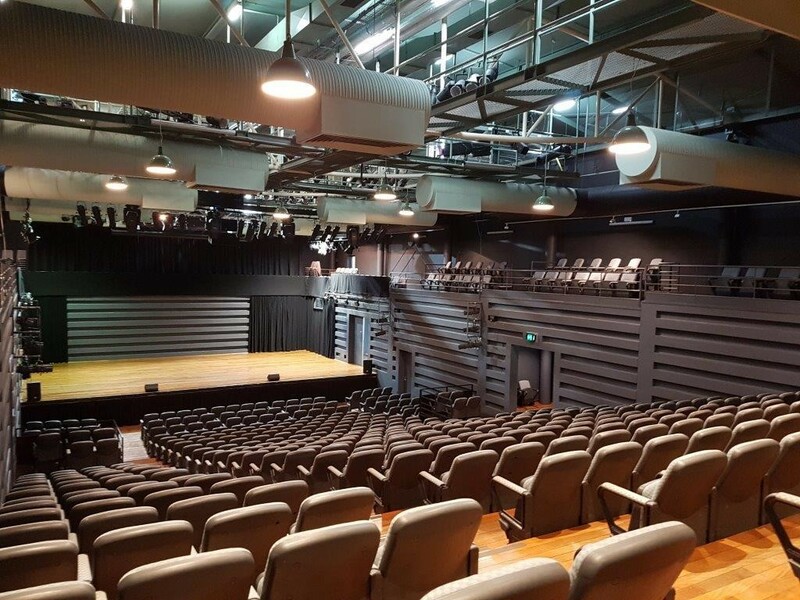 Ryan Wilks has just completed the air conditioning upgrade project for Penrith Council at the Joan Sutherland Performing Arts Centre. 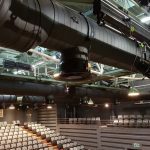 The works included the replacement of the main ductwork within the Richard Bonynge Concert Hall and the installation of new air conditioning systems to service the Malcolm Borland foyer. 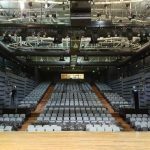 Working in a theatre produces its own unique constraints, such as having to work over seating, uneven floor levels, co-ordinating with stage lighting and most importantly to co-ordinate access based on the theatre’s busy production schedule. This busy schedule meant that we were restricted to short access windows to carry out the work. 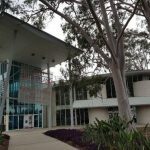 As such the works had to be carefully planned, broken down into components that could be completed within the available time, and be complete so as to still maintain services until the next available window to complete the works. Completion on time was critical given the next scheduled performance. 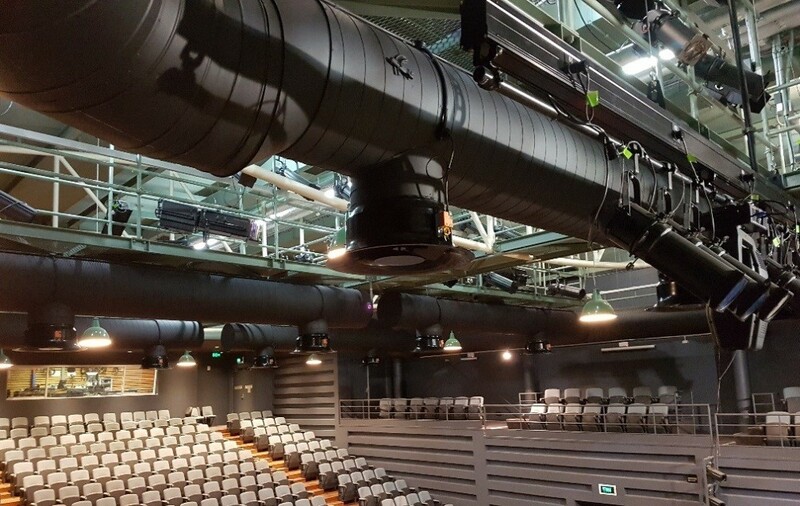 The main concert work involved the replacement of the existing main ductwork and the installation of new motorised swirl diffusers. 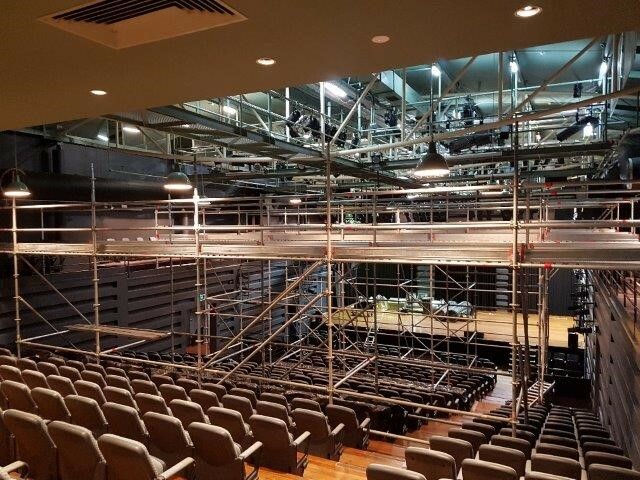 This involved the scaffolding out of the theatre, over the existing seating to gain access to the existing ductwork. 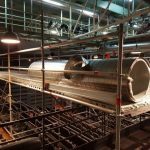 The ductwork was replaced and painted in one week, a great effort by all involved and a testament to good planning and execution on site. Our next access window to site was four weeks later. 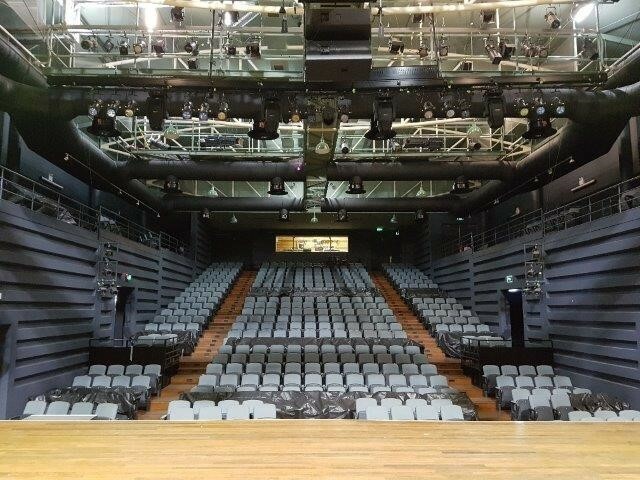 During this window the existing ceiling and outlets in the rear of the theatre were replaced. 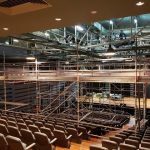 A mobile scaffold was set up over the rear landing and seats to provide access. During this window we also gained access to the main foyer. 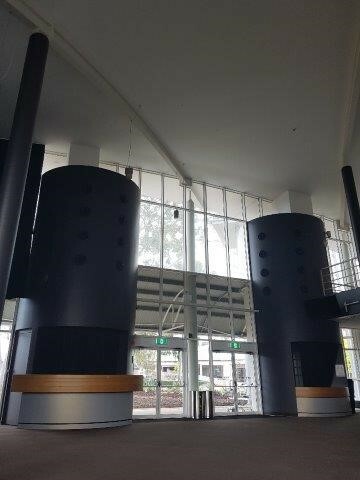 The foyer works involved the installation of a new air conditioning system in the “turret” above the cloak room. 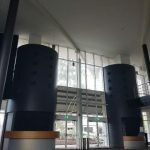 The installation was to mirror the existing lobby air conditioning in the foyer. During the first stage the major building works were completed, the area was tidied and the existing holes temporarily covered until the next available window. The foyer was completed in the next available window, this involved the installation of the new air conditioning unit. As the unit didn’t fit through the doors the unit was supplied loose assembled and was broken down on site and then re-assembled within the new plantroom. 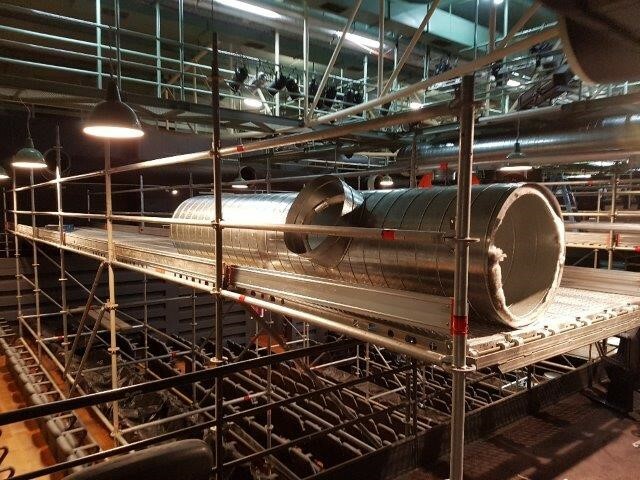 New chilled and heating works pipes were run across the roof and dropped down to supply the new unit. 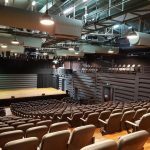 This project is a credit to all involved and showcases the importance of planning and preparation works, working with a quality team that share our commitment and quality of works, but more importantly and our ability to communicate and work directly with our clients to ensure a successful outcome for all involved. 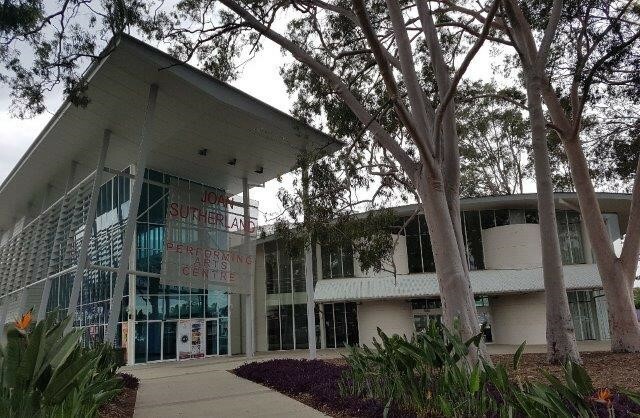 The completion of this project was in no small part due to the involvement and assistance from Penrith Council and JSPAC staff. And now as they say in the business, on with the show !! !